What Will Happen? Does Resetting iPhone Delete Everything? 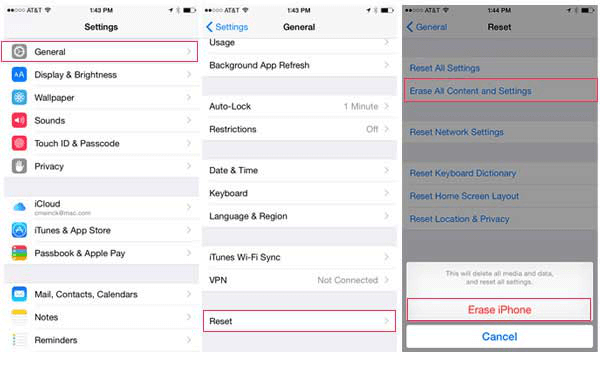 “Does resetting iPhone delete everything? What happens when I reset my iPhone?” If you are confusing with these questions, read this article before you resetting your iPhone. Sometimes you may need to reset your iPhone so it can work properly, but it can be quite an overwhelming task for many. Not all of us know the ins and outs of how to troubleshoot these electronic devices. As such, here you will find some interesting and useful information regarding resetting an iPhone. Part 1: Does Resetting iPhone Delete Everything? Part 2: How to Reset iPhone Directly from Setting? Part 1. Does Resetting iPhone Delete Everything? What happens when you reset your iPhone? Does resetting iPhone delete everything? In simple words, yes it does. When we are talking about resetting iPhone, we are talking the Erase All Content and Settings on iPhone. You can say good bye to your notes, contacts, phone calls, messages, photos, apps and any other personal data you may have stored in the iPhone. That is why, the smartest thing to do is to back it up to iTunes or iCloud before you do anything. Resetting your iPhone also has different meaning when the iPhone is backed up or jailbreaked. Let’s see individually how the reset affects the iPhone. 1 What Does Different Reset Settings Mean? 1. Reset All Settings: This will not delete any of your data. It just helps you reset all the settings on your iPhone. 2. Erase All Content and Settings: This will erase everything on your iOS. It will delete all your photos, music, videos, emails and even your apps. It will bring your iPhone back to its factory state. 3. Reset Network Settings: This will reset your network settings. The usenames and passwords for networks you’ve saved in the past. 4. Reset Keyboard Dictionary: When your iOS doesn’t get the right autocorrect in your typing, you can reset it to make it right. 5. Reset Home Screen Layout: This can help you reset the home screen to its default group of apps when you reset it. 6. Reset Location and Privacy: This will bring the location and privacy settings to its factory setting. Then apps won't be able to use your location information until you allow them to do so. 2 Does Resetting iPhone Delete Personal Data? Many of us have the question as to where does all of our data go when we reset our phones. To put it simply, it depends on what type of reset option you wish to perform on your iPhone. Usually, when you do a full reset, all your data and apps get deleted. The reset causes the phone to return to its original setting as if it were new. However, iPhone allows you other reset options as well. You may go for the “Reset all Settings” option. This will only restore your phone’s settings without interfering with your personal data. 3 Does Resetting iPhone Delete Factory Software? 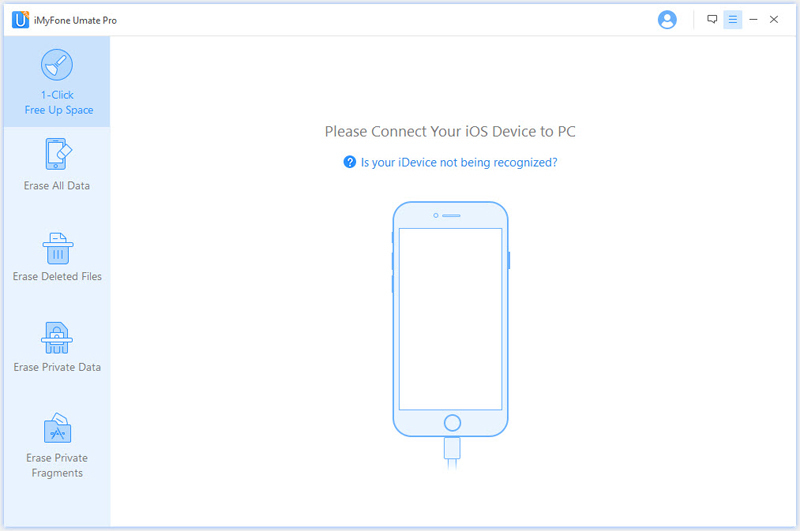 Resetting does not remove the iOS software most recently installed on the iPhone. So, when resetting, the iPhone keeps the latest updated version of the iOS. Stock apps cannot be removed even with resetting. Resetting only clear out the records on factory-installed apps, such as, Phone, Camera, Calendar, Mail, etc. 4 Does Resetting iPhone Delete Jailbreak? Yes, it does. This means that you need to do jailbreak again if you want to use an iPhone like that. iPhone having jailbreak is able to install apps outside of App Store. 5 Does Resetting iPhone Delete Backups? No, it doesn’t. Backups are stored online and you will be able to download them from your iTunes account once you start using the iPhone again. Backups are always advised, not only in case of resetting the iPhone, but also in case of losing or stealing. Part 2. How to Reset iPhone Directly from Setting? 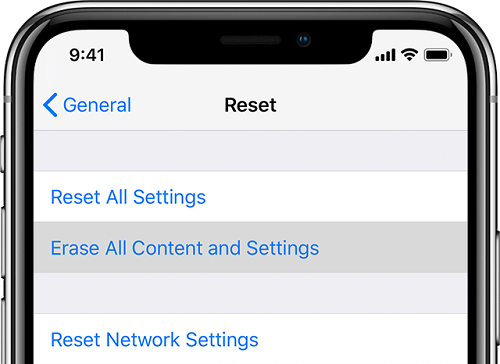 You may wonder how to reset iPhone when something wrong with your phone; you can reset your iPhone directly from settings.Resetting an iPhone from Settings is a pretty easy process. Simply follow the steps mentioned below. Step 1: Go to the Settings app and tap on General. Step 2: Tap on Reset and then tap on “Erase All Content and Settings” for a complete reset. Step 3: Type in your passcode if needed and confirm. Now you know what happens when you reset your iPhone and how to reset iPhone. However, resetting only makes the personal data invisible on iPhone. There is still possible to retrieve them with some recovery tools. If you are some guys who concern much about the private issue, resetting is not safe enough for you. A safer solution, which can promise zero chance of recovery even with the latest recovery tools, will be discussed later. Do you really know what happens when you reset your iPhone? As discussed above, resetting is not safe enough since resetting would not overwrite the personal data. If you want to permanently reset iPhone, without any chance of recovery, the best solution is to use an iPhone eraser which is not related to Apple. One of the very best is iMyFone Umate Pro iPhone data eraser or iMyFone Umate Pro iPhone Data Eraser for Mac. This is very necessary when you need to give your phone away or resell it or donate it, which means your personal data would be access to others. Completely erase everything on iPhone and make it as a new one. 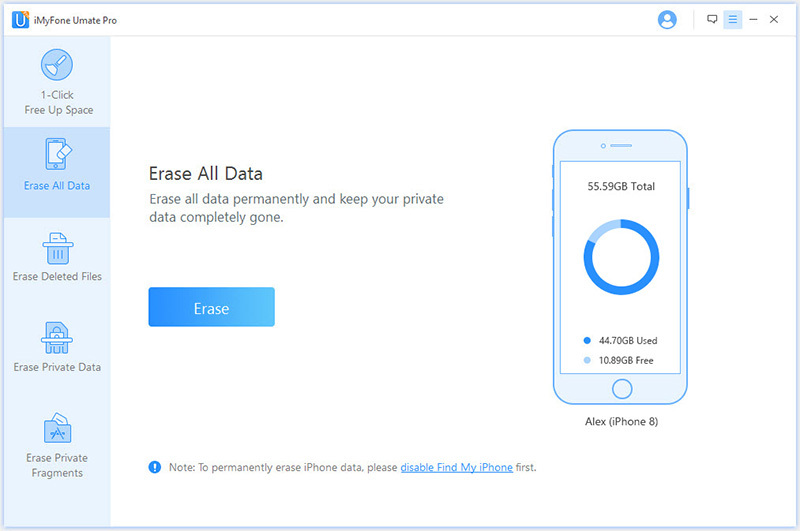 Scan out the private data existed on your iPhone and permanently erase them. Find out the previously deleted files and permanently erase them. Find out and permanently erase fragments for third-party Apps, including Snapchat, WhatsApp, WeChat, Youtube etc. Clean up as much as 30+ junk files or temporary files, including cookies, caches, corrupted files, etc. Fully compatible with iOS 12 and receive lots of positive reviews from macworld.co.uk, Makeuseof.com , Cultofmac.com etc. iMyFone Umate Pro iPhone Data Eraser, with advanced overwriting technology, can promise permanent erasure of any iOS file. That’s why it can make up the insufficiency of resetting. Even with the latest recovery tools, erased data by this software cannot be retrieved. It is necessary especially when you are going to sell your iPhone or you want to erase all traces. 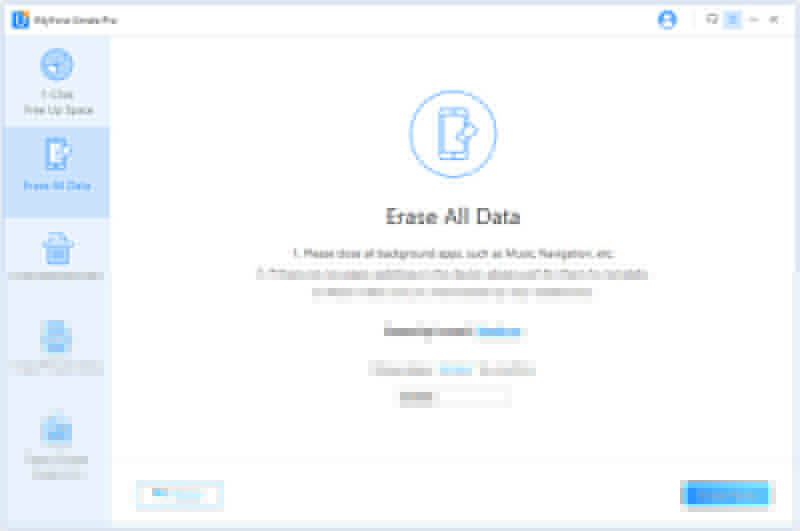 With iMyFone Umate Pro, you only need 3 steps to permanently erase your iPhone. Step 1:Download and install the software on your computer. Connect your iPhone to it. Step 2: Go to Erase All Data tab and click Erase button. Step 3: Type “delete” into the box to confirm and hit Erase Now button to start. Go to the iCloud app that comes with your iPhone. Login with your iCloud account details and download the backup information on your iPhone. Connect your iPhone or iOS device with your computer. Download iTunes for PC or Mac and login with your account. Click your iPhone icon and choose Restore Backup to start.